Check out the latest from the Chippewa Hotel in the Chippewa’s facebook feed to the right or click through to the Chippewa Hotel on Facebook. Live entertainment nightly during the summer of the Pink Pony Bar & Grill. Keep up with the latest entertainment news at the Pink Pony on Facebook. A stay at the Chippewa Hotel puts you right in the middle of all the charms of Mackinac Island. Choose a main street room and wake up to the clip-clop of the horse carriages passing along the street below. Stay in a Harbor View waterfront room or suite and enjoy the views of the harbor and the Straits of Mackinac from your balcony. Treat yourself to the Club Level Corner Suite or the Harbor View Corner Suite and you have views of the harbor, marina and Fort Mackinac from your room. You can completely immerse yourself in the life of Mackinac Island when you stay at the Chippewa. 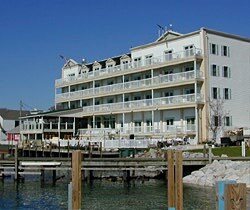 Located at the eastern edge of downtown – just below historic Fort Mackinac – the Chippewa Hotel Waterfront offers a wide variety of rooms – from deluxe hotel rooms to one and two-bedroom suites with balconies. Guests can also relax on the scenic sun deck overlooking the harbor and enjoy the warm waters of the expansive hot tub.You can have a casual breakfast, lunch or dinner at the famous Pink Pony Dining Room and Bar, where you can eat outside on the patio watch the ferries arrive and depart from the harbor. For those who want to burn the midnight oil, the Pink Pony Bar is famous for some of the best nightlife on Mackinac Island with live entertainment nightly during the main summer season.